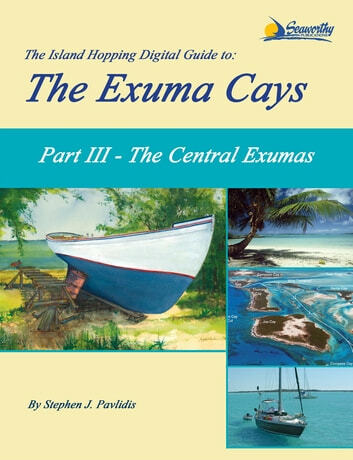 This edition is Part III of The Island Hopping Digital Guide to the Exuma Cays and covers the Central Exumas. The Island Hopping Digital Guides are the digital versions of the world-famous cruising guides written by Stephen J. Pavlidis. Over the past 20 years, Stephen J. Pavlidis has written more than 10 excellent cruising guides covering all of the waters from south Florida to the islands of Trinidad and Tobago and everything in between. Each cruising guide contains many color charts, photos and loads of current local knowledge making this a must-have guide for yachts planning to cruise the Bahamas. With full-color aerial harbor photos and full-color sketch charts, it contains extremely accurate hydrographic data based on personally conducted independent surveys by the author. Each guide also includes extensive navigational instructions, GPS waypoints, approaches and routes, anchorages, services, dive sites, history, basic information for cruising in the Bahamas, extensive appendices, contact information and more. These cruising guides are not only essential for navigation and piloting while cruising the Bahamas, but also for use at anchor or dockside because of the valuable shoreside information they contain. The digital versions also have the added convenience of live links for email and websites to the many services and marinas found throughout the region. In addition, they make excellent planning tools for future adventures.